Want to know where some of the dances in Strictly Come Dancing come from? Take a look at our guide to dance in classical music, featuring historical dances all the way up to today. 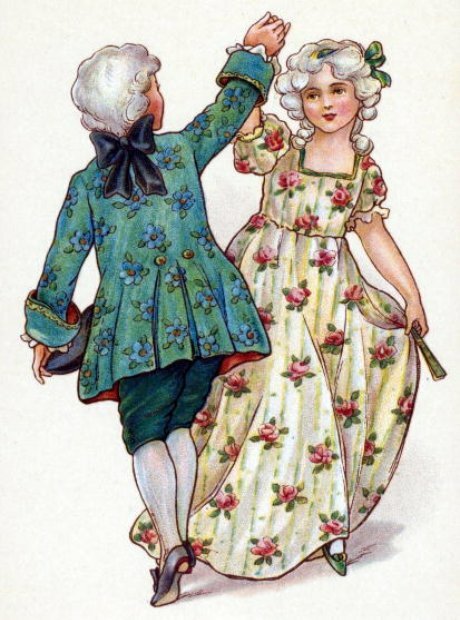 One of the most popular dances of the French renaissance, the Gavotte is characterised by its distinctive rhythmic pattern. Handel and Bach in particular were fond of the quirky rhythm, and frequently incorporated a Gavotte into their works. If you're ever called upon to perform one, the steps mostly go from side-to-side and participants stand in a line or a circle. In something of a departure for Strictly Come Dancing, Holly Valance and her partner Artem Chigvintsev performed a ballet-inspired dance to Tchaikovsky's music from Swan Lake in 2011. This is a confusing one - the Polonaise is, like the Mazurka, Polish in origin, but its name is the French word for 'Polish'. So it's sort-of French too, in a way. No matter where it's from, Chopin was one of the biggest exponents of the form, while other big-hitters in the Polonaise world include Mozart, Schubert, Weber and Schumann. This picture shows Chopin playing one of his Polonaises at a dance. This light and nimble dance is the equivalent of an Italian 'Scherzo' (literally 'joke') and is rather similar to the Gavotte. The most famous example of a Badinerie is in Bach's Orchestral Suite and, strangely, is a popular mobile phone ringtone. Here he is in his dancing shoes. The waltz has a long and distinguished history, but undoubtedly the modern master of the genre is Andre Rieu, the self-styled King Of The Waltz. He even guested on Strictly back in 2011. Another Baroque favourite, the Allemande is littered throughout the whole period. However, once the likes of Bach and Corelli had finished with it, early romantic composer Carl Maria Von Weber made the Allemande sound a little closer to the waltz style with his Douze Allemandes. The tango is one of the most passionate dance styles in modern dance, and there's a wealth of material throughout the classical world. Here's the Montenegrin classical guitarist Milos Karadaglic performing Piazzolla's Libertango at this year's Classic BRIT Awards. Originally a reserved and delicate dance for two, the Pavane has taken on a life of its own as a musical form. The most famous examples are Faure's Pavane and Ravel's Pavane for a Dead Princess. Like the waltz, the Strauss family were particularly partial to a polka. Perhaps the best-known example is Johann Strass II's Pizzicato Polka, a delicate and lightly comical little piece. The first performance of the piece in Russia went down so well that the crowd demanded nine encores. Another dance with roots in the Baroque era, the Hornpipe is best-known nowadays for its lively incarnation in Henry Wood's Fantasia on British Sea Songs. The dance itself incorporates lots of nautical moves, including holding the hand to the forehead as if looking out to sea. Probably won't be on the next series of Strictly. This Polish dance has roots in the 19th Century, when it became a popular ballroom style. Unsurprisingly, Polish composers like Chopin and Szymanowski thrived on the dance form of their homeland, and produced countless examples. The Sarabande has its origins in 16th Century Central America, but became popular when it crossed over to Spain via the Spanish colonies. The musical form, though, caught on with lots of composers - Britten (pictured), Debussy and Vaughan Williams all came up with classic examples, while their predecessors in the Baroque period often incorporated a Sarabande into their dance suites. Predominantly in 3/4 time (like the waltz), the Minuet became popular in the Baroque period - but then super-popular in the Classical period when it was combined with a Trio section as well.